Companies are continuously working with their sales organizations to address the most pressing challenges that exist in the marketplace. The sales function is like the unharnessed and unexplored world of space. There is so much we don’t know and are learning each day. Sales organizations thrive in the chaos of what is the latest and greatest tool, technique or sales system. The chaos is real, the competition is fierce and bodies of those who do not succeed in the business litter the hallways of every organization. 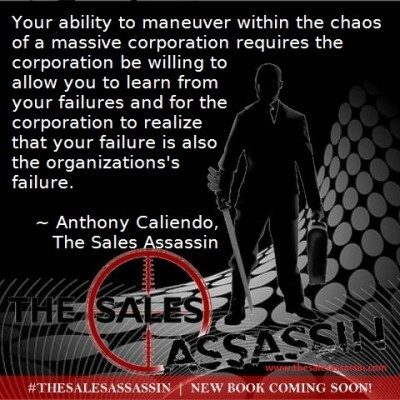 Achieving great sales organizations and growing great sales professionals starts at the top of any organization. The best sales organization achieves success starting with the CEO and working down to achieve buy-in and a commitment from all elements of the organization. When the proper buy-in is achieved, risk and the challenges are minimized. It is at this point that sales organizations begin to transform themselves. Your ability to maneuver within the chaos of a massive corporation requires the strength and willingness to at times fail before succeeding, but it also requires the corporation be willing to allow you to learn from your failures and for the corporation to realize that your failure is also the organization’s failure.